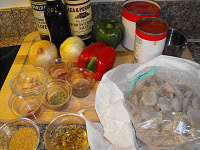 Fat Tuesday is right around the corner and this is the perfect time of year to make one of my favorite New Orleans recipes, Shrimp Creole. If you are giving up meat for Lent — or you just want a simple new recipe to enjoy seafood — this is a great option. When I make it at home, I often start the rice in my rice cooker and have the entire dish assembled and ready to eat by the time the rice is done. This is a great recipe to make when company is coming. Thanks to the vegetables in the rich, tasty sauce you don’t need as much shrimp and it really is a low stress dish to make! By the time your rice is done, the shrimp creole will be ready to eat! Just after adding shrimp,cook a few more minutes and it is done! Fat Tuesday is a great excuse for making this delicious feast...but you can enjoy it all year 'round! 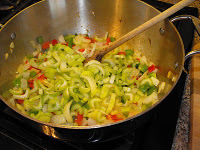 Heat olive oil in a large pot; add onions, peppers, celery, and garlic. Stir and cook until onions are translucent. Add Worcestershire, celery seed, oregano, Tabasco, cayenne, beer, and the juice from the can of whole tomatoes. 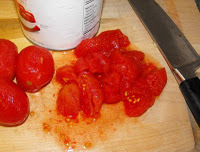 Coarsely chop the tomatoes and add them to the pot. Add tomato sauce, brown sugar, and cider vinegar. Stir and allow to simmer until it thickens to your desired consistency. 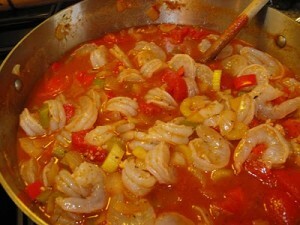 Stir in the shrimp and allow to cook an additional 5 minutes or until shrimp are pink and cooked through. Serve over rice with more Tabasco if desired.